Ah, the early 1990’s. Let’s take a trip back to the golden age of hip-hop and R&B. The peak of the funky fresh sound known as New Jack Swing. And the arrival of the first notes from a group of young men who would soon conquer charts and hearts with their harmonies in four parts. Boyz II Men met as students in the hallways (and bathrooms, due to the excellent acoustics) of the Philadelphia High School for the Creative and Performing Arts in the mid-80’s. 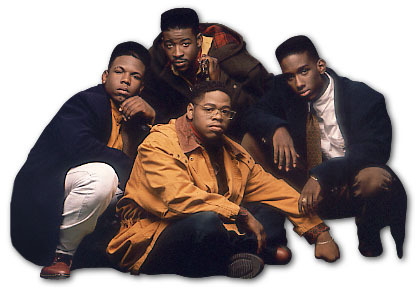 They initially blended voices under the name Unique Attraction but, after a few lineup changes, settled on the name Boyz II Men, taken from the title of a song by the sweet-singing, smooth-dancing group they modeled themselves after, R&B/pop hitmakers New Edition. With the boldness of youth, and with a move that sounds straight out of a pop fairytale, the boys snuck backstage at a concert in 1989 and talked their way into performing a New Edition song for one of its members, Michael Bivins. Amazingly, it worked. Bivins offered to manage the group, hooked them up with Motown Records, and helped produce their first recording sessions. Dreams can come true, kids! 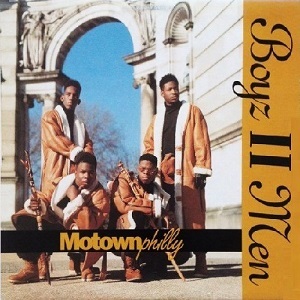 Although Boyz II Men later gained fame for their heart-tugging ballads, their first break came with “Motownphilly,” an uptempo track whose title paid homage to their two biggest influences, the music of Motown in Detroit, and their hometown Philly Soul. The song’s autobiographical lyrics reference how the group used to dream about hitting the big time and even includes a rap by Michael Bivins detailing how they auditioned for him. Boyz II Men also manage to repeat their own name over 20 times during the course of the 4 minute song. That’s a savvy PR move — I might try it in my next post. When released as a single in the spring of 1991, “Motownphilly” landed in the Top 5 on the pop charts and went into constant rotation on MTV. Soon enough, the quartet would score a slew of record-setting #1’s. So do a little east coast swing … with Boyz II Men.